"History Yet To Be Written"
For all the mind-bending action, deepening conspiracies, and technological feats, Orphan Black is still at its heart about two things: the fights for families and for control. Both these themes do get some straightforward attention. The right to control has been explored in depth with the clones’ genetic sequences, kidnappings, captivity, and the pure power of knowledge. Then, the fight to protect their families drives the emotional beats. After all, the only reason Sarah took on Beth’s identity in the first place was because she saw it as the only chance to get enough money to run away with her daughter. As the series has progressed, though, these two struggles have overlapped and intertwined. Family and control have become inextricable from each other in ways that both sing and sink. Sarah has expanded her definition of family beyond her brother and daughter to include a whole new set of sisters she never knew, and transitioned from calling her foster mother “Mrs. S” to “mum” in times of crisis. Alison just wants to find some normalcy in something as “normal” as becoming school trustee, but she nonetheless embraces the opportunity to host a dinner party for her clone “sestras” and the people who mean the most to them when the election results come in. Helena, constantly traumatized and taught to look out for herself, has been brought back from the brink again and again because of her deep respect for family. Even the unflappable Rachel Duncan cracks when she has to confront the family she lost when she was taken from her parents. Then, as this season dived into the background of the male Castor clones, we found out they grew up calling their commander “Mother” and doing everything together. “We would huddle together like puppies,” Rudy says with a fond smile, right before the light in his eyes flickers like a short-circuiting bulb and goes out for good. This is the memory he clings to; his loyalty to his family is the sole reason he has done anything. 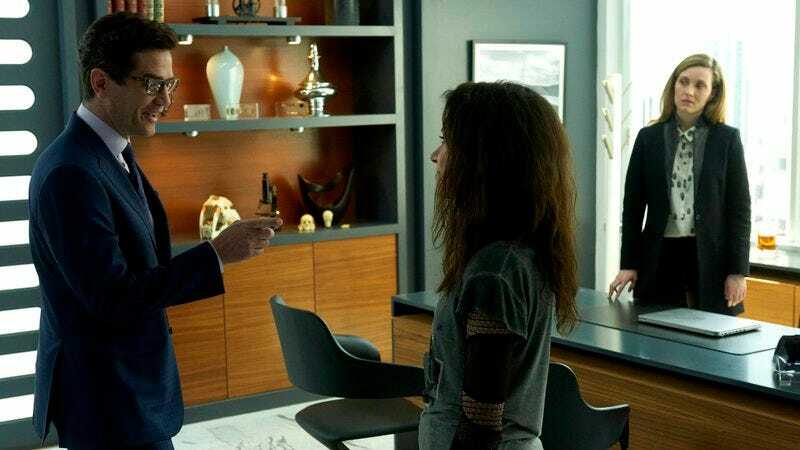 In a finale obsessed with family, the most exemplary moment of the show’s approach to family and control themes comes early on when Cosima coaxes Kendall to give up some of her genetic material. Siobhan’s mother is furious, guarded, and—as is fitting and smart given what we’ve seen—unbelievably afraid. Her entire life was upended when she was the unwitting test subject for human cloning. She didn’t choose it, and she sure as hell didn’t choose to walk into this warehouse for further testing so many years later. Sarah, Mrs. S, and Felix spend the majority of this episode winnowing through their threats and narrowing them down to something more manageable than ten fire-breathing Hydra heads, so their capacity to tolerate Kendall’s surliness is limited. But then Cosima walks into the biohazard tent. She looks at the scowling woman who started everything, and recognizes her crisis. Everyone on this show has been through hell, but one of the most devastating moments is still when Cosima realized that Dyad identified and owned her as 324B21—just a number, a scientific oddity, a curiosity devoid of humanity. When Kendall spits that Cosima’s just a “bad copy” of her, Cosima recognizes the desperation, and pushes back with gentle empathy. Cosima tells Kendall with a patient smile that she’s really their big sister, and they need her, or she’ll die. And so while Siobhan’s threats of acid baths might have forced Kendall to come along for the ride, Cosima’s commitment to showing human conflict in something Kendall so fiercely told herself was just wacky science is what ultimately earns her trust. To be on the nose about it: it’s what lets Kendall make her own choice, for her new family. Still, much of the episode is dedicated to Sarah’s quest to eradicate the many enemies they have been facing, out of necessity. The forces surrounding the clones have dramatically complicated, and this season struggled as it tried to both keep the twists coming and keep them somewhat streamlined. The steady knocking down of threats in “History Yet To Be Written” (as written by co-creator Graeme Manson) is a steady relief. She (and Felix channeling John McClane) get Mark to turn on Coady so he and Gracie can continue to live their lives outside of Castor and the Proletheans. She gets Delphine to bring her to Ferdinand (the always welcome James Frain) so they can arrange to give Topside some of Kendall’s genetic material without giving her up completely. Then, when she thinks she has everything handled, she finds out that the Neolutionists were behind everything. (The call was coming from inside the house!) It’s only a matter of time before she finds out that Susan Duncan is the Neolutionist mastermind pulling the strings. Sarah has so much to get through in this episode. The sheer amount of threats they have to strike down emphasizes just how many threats have piled up on top of each other, and while it’s exciting to watch them fall, the arduous path to get here took away from some of the issues that could have had a wallop of an impact—like, say, Coady planning to use sterility as a weapon. This deeply disturbing plotline never got quite the depth it deserved, often getting lost stuck in the mire of existing conspiracy. This question of female agency and dangerous power trips is exactly the kind of situation Orphan Black excels at depicting, given enough space. It could—and perhaps should—have been the fight all season long. Outside of the shadowy power players, though, this is an episode about reunions—and one devastating goodbye. The clones are reunited with their big sister genetic predecessor. Siobhan reunites with her mother as Kendall explains through angry tears how she sent Sarah her way all those years ago. Alison, Cosima, Sarah, and Helena reunite for that dinner scene, the technical and emotional equivalent of last season’s dance party. Helena, always a source of heart in surprising places, has two significant reunions. The first is with Jesse (Patrick J. Adams), the earnest man she met in a dive bar last season with hearts in his eyes. Their heated makeout in his tow truck is a welcome change of pace from the horrors she’s gone through all season—but I would be lying if I said I didn’t actually clap when it became clear Helena was finally going to have a hand to hand confrontation with Rudy. Alison’s garage becomes a battleground yet again as Helena grips a roll of duct tape, eyes her opponent, and declares that “prison rules” are now in effect: “Only one of us leaves alive.” The ensuing fight is more brief than expected, but Tatiana Maslany and Ari Millen’s chemistry makes it electric from the moment Helena whips the duct tape into Rudy’s forehead to when he glitches and hits the floor, hard. Evelyne Brochu has been enormously appealing from the beginning, which makes sense, since Graeme Manson confirmed to me in a post-mortem for this season that they wrote the part of Delphine with her in mind. Delphine’s relationship with Cosima has produced both incredible happiness and devastating heartbreak, and Brochu and Maslany have acted the hell out of it every time. But Delphine has never had as much drive or interest as she has this season as a top player in Dyad. Her love for Cosima and the Leda clones contrasted sharply with her slow and steady embrace of harsher techniques as she got more and more entrenched in Dyad’s “whatever it takes” mentality. She put on the veneer of a colder person to survive, but Brochu always let the edges of vulnerability crackle at Delphine’s brittle edges. Even when she wasn’t fending off robotic mouth worms(! ), Brochu’s depiction of a woman on an incredibly personal mission was a brilliant performance, and so it’s sad to see her go. There is undoubtedly more to Delphine’s death. Though Manson also confirmed to me that Delphine is “for all intents and purposes” dead, we never did see a body, and she used her last words to ask her unseen assassin, “what will happen to her?” As always, the comments are open for speculation, but for now I will keep my attention on appreciating the time we had with both Brochu and Delphine. Once Orphan Black dives back into the muck for the fourth season, there will likely be no time to breathe, let alone mourn. As mentioned, I got a chance to speak briefly with co-creator Graeme Manson about the episode and season, and you can check that out at this here link! I would like to take a moment to appreciate James Frain, whose unapologetically slimy Ferdinand became one of my favorites with just two lines: throwing a tantrum about Neolutionists (“ugh, they’re like ticks, you never know when you’ve got one on you!”) and the refrain of “who’s a dirty clone?” followed by Sarah’s smirking, “you are” in Rachel’s voice. Next season wishlist: more Krystal, Tony, and Beth. Insight into Rachel’s robotic eye. Repeat performances from Michelle Forbes and James Frain. Alison’s suburban life intertwining more with the others. Even more of Felix and Sarah teaming up for cons. And, in Delphine’s honor: crazy science.